February has been a great month for 3D Revolution! Over the last week we have worked with some amazing projects spread all along the east coast of Australia. From Queensland down to Tasmania. Have a look at a few of our favorites! Our friends over at Ritson Design are creating this amazing, 3 story Mansion to be built on Lorrie Place in Park Grove, TAS. Within 5 minutes of the northern coast beaches of Tasmania, this extravagant lot boasts 738 square meter’s of floor space, spread over 5 large bedrooms, 6 bathrooms, a multitude of living and entertainment area’s, a large kitchen and dining room as well a home office and library on the 1st & 2nd floors alone. Below the house, the lower floor contains a double garage, bike storage, a full gymnasium and a home based store with private side access for clients. To kick start this project Ritson Design got in contact with us to provide them with 3D Renders to showcase their designs. They wanted to know how their project will look at both night and day so we provided them with a Street Scape Render in both High Definition (above) and High-Dusk Definition (below). With the use of powerful lighting techniques our expert designers were able to capture this project extremely well in both lights and were able to provide detailed insight into the future of this project. With the goal of creating an extremely modern, stand out Duplex that uses functionality to fit a lot into a small space. Our friends over at Northerly Aspect have designed this incredible set of Duplex’s for our Client James who is looking to move in to the new project with his partner once it is completed. 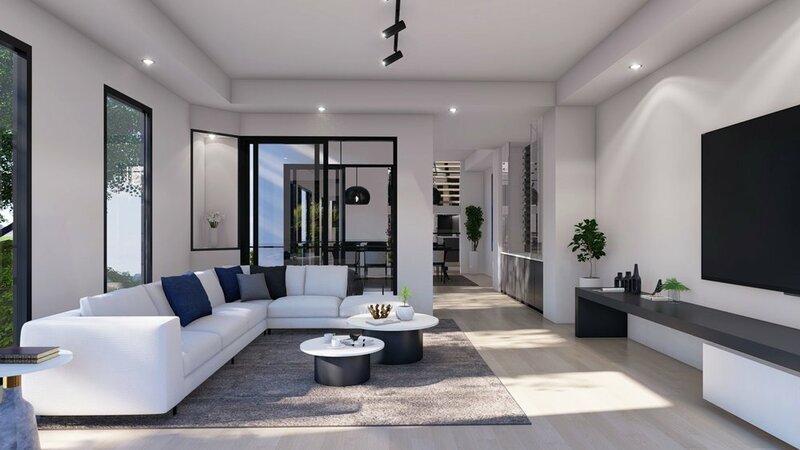 Situated in Miami, along the Gold Coast Highway, our clients have essentially reinvigorated a small block to fit two, 3 story Duplex’s, both with 3 bedrooms, 2 & 1/2 bathrooms, a well sized kitchen, dining room, a study and an outdoor entertainment area that opens up to the in ground pool. 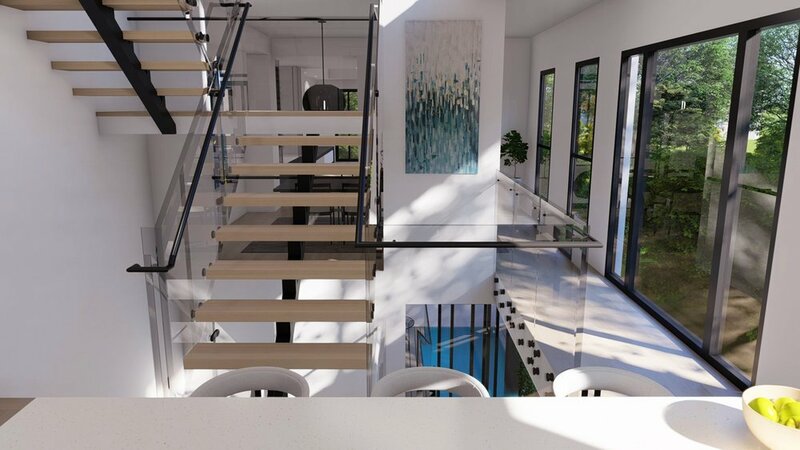 Our client James not only had the need to market the additional duplex, but he really wanted to use 3D Rendering as a way to get all the details just right for his next home. He got in contact with us and we sat down to go over EXACTLY what he wants to see. In doing so we provided our clients with a number of 3D Renders including a Streescape of the front that really shows the use of modern architecture in combining light rendered textures with timber panels and tinted glass to create an extremely effective finish. Additionally we provided them with Interior Renders that will take you through most of the new home. As seen above, we show the living area, kitchen, master bedroom and mid level stairway. As well as a shot looking down at the outdoor entertainment area from the level above. To finish this off our client wanted an extra large render that shows the outdoor entertainment area with in ground pool and patio kitchen. 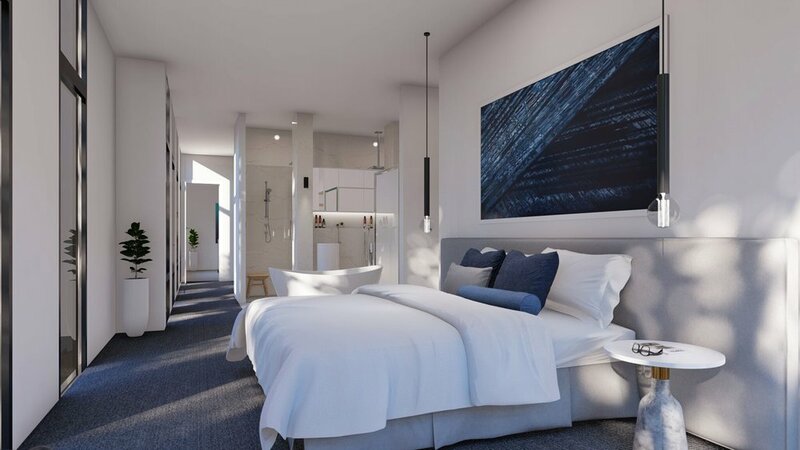 Check out this new project our friends at Marina Property Investments are planning to build on Durham Street in Campbeltown, Western Sydney. Our clients are looking to completely replace the 2 existing lots with a large development that will contain 6 brand new units. All 6 units are similar in design and will include 3 bedrooms, 2 bathrooms, an open living and dining area as well as a garage and several small balconies / patios. To get real insight into how their future project will look completed, we provided Marina Property with a 3D Streetscape Render showing the front of the development and how it will look from the street. Additionally we provided a site perspective that lets you see into the project from above and is a great way to advertise the overall project. Older PostBig Changes For This February!